In 1969, Rudy Crosswell and his all-American GI team shocked the nation by taking third place in kumite at the all-Japan Seishin-kai National Championships — shattering the stereotype that only Japanese nationals were truly capable of mastering the art of traditional karate. The late Rudy Crosswell, an Air Force veteran, had the maximum martial arts experience. His martial arts journey began as a skinny 13-year-old boy in Jersey City, New Jersey, in 1960. Crosswell passed away Sept. 25. He joined the Air Force in 1965 and spent time at Luke Air Force Base as a radio operator from 1965 to 1968. However, his talent for the martial arts would be a large part of his Air Force experience. His journey to Luke included training stops at Lackland AFB, Texas; Keesler AFB, Mississippi; and Seymour Johnson AFB, North Carolina. Once he arrived at Luke, Crosswell faced a daunting workload. There were 30 radio operators and 10 radio vans, Crosswell said. Rudy Crosswell’s martial arts journey began as a skinny 13-year-old boy in Jersey City, New Jersey, in 1960. Crosswell passed away Sept. 25. 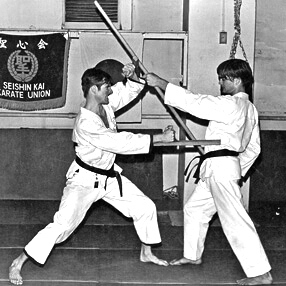 Besides his plethora of duties as a radio operator, Crosswell continued to pursue his love of the martial arts and was awarded a Shodan black belt in 1967. He remembered that he had met Maj. Asa Herring, who was a martial artist. Herring was teaching a karate class of six students. “There were Tuesday, Thursday and Saturday classes in Bldg. 855,” Crosswell said. “Herring had us fill a trunk with rocks and showed us the technique of breaking them. It wasn’t long until the major asked me to take over the class. What’s more, one of Crosswell’s fondest memories of his time at Luke was an invitation to a martial arts tournament in Las Vegas, Nevada. “I received an invitation to a tournament in Las Vegas that Chuck Norris was sponsoring,’ he said. “I put in for TDY orders — Luke to Nellis AFB for the tournament. The actual event was held at the Flamingo Hotel. 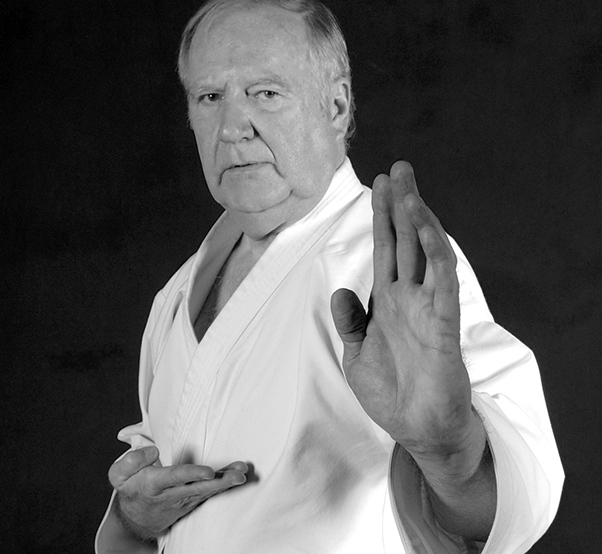 A profound change awaited Crosswell, when he received orders to report to Fuchu Air Station, Japan, in 1968, which provided him some of the best years in his nearly six decades of martial arts. On the military side of his three years there, Crosswell had a top secret clearance. On the martial arts front, Japan was heaven for Crosswell. His years there gave him the opportunity to be with the masters and to pick up an abundance of knowledge and information. One of the highlights of his years in Japan was being part of the all-American GI team and taking third place in the all-Japan Sershin-Kai National Championships in 1969. “It shattered the myth that only Japanese teams were capable of mastering the art of traditional karate,” Crosswell said. After three years in Japan, he received orders in 1971 for Minot AFB, North Dakota, a location that was significantly different from Japan. Minot AFB was a refueling base at the time, he said. “I ended up cross-training and found myself in the orderly room typing performance reports and preparing supply requests,” he said. Despite the frigid weather and conservative culture, Crosswell set up a thriving martial arts class at Minot. 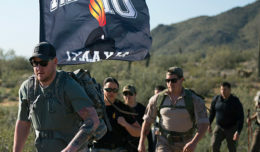 He was honorably discharged with eight years of service in 1973 and moved to Phoenix. His thirst to practice and teach martial arts only increased as he set up a school, which is still thriving to this day. His school is called Arizona Budokan, which focuses on four types of martial arts. Crosswell’s 45 years in Arizona were an incredible ride, filled with teaching and honors. He received a special honor in 1985, awarded by Japanese master Soke Teruo Hayashi — the title of Shihan, which means a master level instructor, along with a sixth dan ranking in Hayashi-Ha Shito-Ryu Karate. The dan ranking system is employed by numerous Japanese organizations and Korean martial arts to indicate the level of a person’s ability within a particular subject matter. At a time in his career when many other high-ranking martial artists are content to sit back and take a passive approach to their own training, Shihan Crosswell never stopped actively seeking out new karate, kobudo, and sword information, all the while devoting his heart and soul to nurturing individual students at the Arizona Budokan. Not only that, a myriad of achievement and honors would soon follow. 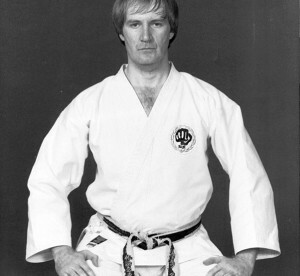 Shihan Crosswell received a profoundly special award in 1987. The legendary Kobudo master, Soke, celebrated Shihan Crosswell’s accomplishments in Okinawan weapons by granting him a fourth dan ranking in Kenshin-ryu Kobudo, the pinnacle rank that Soke has ever bestowed in the art. Although Shihan Crosswell had taught martial arts throughout the United States and the world for more than 50 years, and was a master in three separate styles of Shito-Ryu Karate (Motobu-Ha, Hayashi-Ha and Seito), he never lost his sense of tradition, dedication and humility, and wanted to instill these values in his students. He said he was a traditionalist and taught what was passed down, always stressing dedication and quality over quantity. Shihan Crosswell said he was blessed to have the help of his wife, Dawn Croft, who helped with the teaching and speaks Japanese fluently. Ms. Croft also holds a third degree black belt in Shito-Ryu and Kobudo. What’s more, her skills in speaking Japanese are so good that she has worked as a translator for business and the government and does freelance translating. Ms. Croft said the school founded by Crosswell will continue operations in the wake of his passing. It will be headed by her with support from the other senior instructors. There is an old adage that says, “Tradition is the cornerstone of excellence.” From his days as a young Airman and throughout his life, Shihan Crosswell never lost sight of this value. His example of the principles of hard work, dedication, humility and love and respect for tradition will live forever. Editor’s note: The interview for this story took place in July 2018. Crosswell passed away Sept. 25. More information on Shihan Crosswell’s life in martial arts can be viewed on YouTube by typing in Rudy Crosswell. 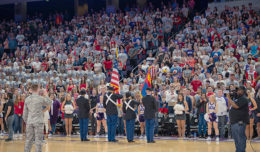 A tribute on Facebook can be viewed by going to https://www.facebook.com/arizonabudokan/.